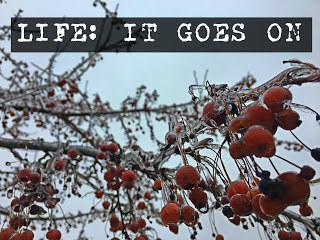 I think I need a new "Life: It Goes On" picture for this time of year. Something that shows a mound of dirty snow melting in the sunshine, perhaps? Yesterday the thermometer in my backyard showed that it was 77 degrees; that wasn't right (it sits in the sun) but it was ridiculously nice out. And where was I? I spent most of the day in the basement cleaning and organizing. That's some poor planning there, folks. 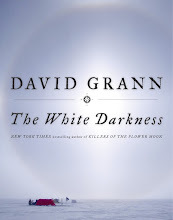 Listening To: I will finish The 19th Wife this week. I think it's going to end up being one of those books that I would give "C+" to, if I gave grades. It's not bad, but it's not wow'ing me. Perhaps the last fourth will knock me out. Watching: Some college basketball, some Grace and Frankie, The Voice. 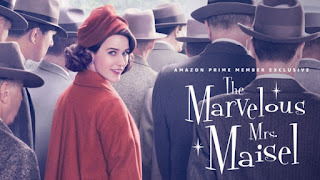 This week I also got on the The Marvelous Mrs. Maisel bandwagon. I'm half way through the first season and really enjoying it. The costumes and sets alone are worth tuning in for at least once. Reading: At least I'm listening to a book. I cannot make myself sit down and read otherwise. It may be time to give up on The Revolution of Marina M. It's not necessarily the book, it's just not the right book for me right now. Making: Chicken and noodles, pasta with crab, rice pudding, grilled steak and mashed potatoes, and scotcheroos. Planning: On heading back down to the basement shortly for some 40 Bags In 40 Days work. Yesterday, just in prepping it for a party, I managed to get rid of a good-sized box of things. It's one big room that tends to look more like a closet than a usable room. Time for that to change. Thinking About: Politics. My head hurts and I'm tired. Enjoying: Celebrating both of our girls' birthdays - Miss H and Mrs. S have the same birthday! Also, what's turning out to be a regular Thursday lunch with Mini-him. Feeling: Tired. Damn, getting the house ready for Miss H's party was exhausting. But it certainly does look better! Looking forward to: My friend's annual Academy Award watching party. Always good food, fun cocktails, and a lot of judgment and laughter! I'm interested to see how the #metoo and #timesup movements will impact the night. Question of the week: Will you be watching the Oscars? Do you have any favorites? I am sorry you aren't enjoying The 19th Wife better. I enjoyed it quite a bit when I read it. I keep meaning to read the author's Danish Girl but haven't managed it yet. I hope everyone had a nice birthday! No Oscars for us, I'm afraid. We will be watching Mary Poppins instead. Now that my daughter has "discovered" musicals, she wants to see them all. LOL Have a great week! No Oscars for me. I ended taking a long, hot bath and enjoyed every minute. I could use more of those. If it makes you feel any better, we had beautiful sunny skies all weekend, but I spent it in a convention center and hotel. We didn't step foot outside once. How sad is that? I wish I could have gone to an Oscar party. I volunteer Sunday evenings so I only watched the first hour. Seemed like it started off well, tasteful, with a nod to all of the movements but not over the top with the mentions. I've seen Get Out and Dunkirk but by Oscar standards, I didn't expect them to win. I love the glamour and glitz. Loved, loved, loved Marvelous Mrs. Maisel--cannot wait for season 2. Thought Lenny Bruce as guardian angel was simply brilliant. I need to get going on the bags of stuff as well! I'm so happy you are enjoying the Marvelous Mrs. Maisel. Such a wonderful surprise. I'm really happy Get Out won best original screenplay! Lit: Uniquely Portable Magic - What's On My Nook?